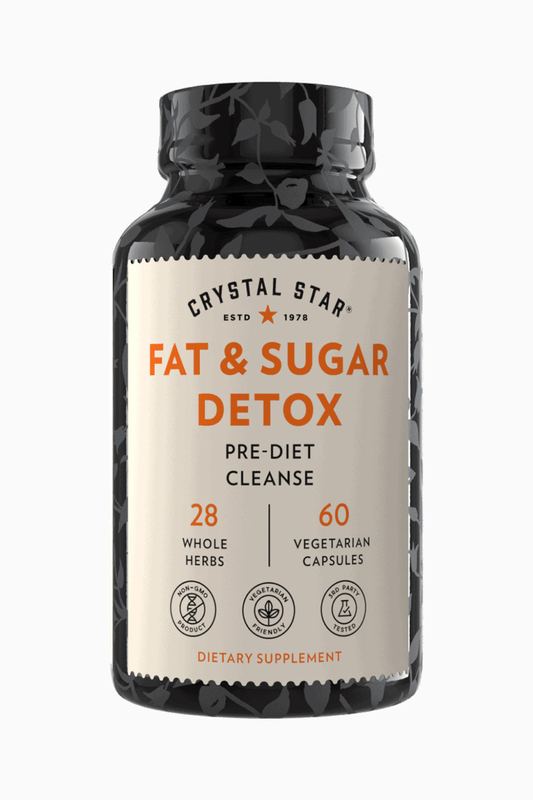 Fat & Sugar Detox, 60 vegetarian capsules (Crystal Star) - Penn Herb Co. Ltd. 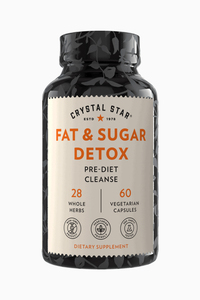 Crystal Star Fat & Sugar Detox™ aid natural metabolism of fats & sugars while normalizing food cravings. Boost metabolism of fats and sugars with a detoxifying blend of 29 whole herbs including: CLA to break down fat, Garcinia cambogia to burn fat, Cleavers to release bloat, and Gymnema to curb sugar cravings. Vitamin B6 (Inositol) 7.9 mg; Chromium Picolinate 50 mcg; CLA powder; Green Tea Leaf; White Tea Leaf; Garcinia Cambogia; Chickweed Herb; Nopal; St. John's Wort; Fenugreek Seed; Guarana Seed; Gymnema sylvestre extract; Dandelion Root; Maca root; Gotu Kola; Siberian Eluthero; Jiaogulan; L-Glutamine; Spirulina p; Fennel Seed; Uva Ursi; Grape Seed Extract; Coleus f; L-Tyrosine; Betaine HCl; Sida c. Root; Inositol; Cleavers; Ginger Root; Cinnamon Bark Extract; Burdock Root; Sarsaparilla Root; Marshmallow Root; Mustard Seed; Capsicum a. Pepper; Kelp. Other Ingredients: Vegetable-source Maltodextrin and Magnesium Stearate, Vegetarian Capsule (vegetable cellulose, water). Boost metabolism of fats & sugars while reducing food cravings. Take 3 capsules daily one before each meal.